As much as I love coming up with new and creative dinner ideas and trying new entree recipes, I have to admit that I am terrible about making lunch for myself. To keep myself eating healthy and on a budget, I pack and bring my own lunch to work almost every day. Sometimes I just run out of ideas or I get lazy trying to put it all together the night before and it usually ends up consisting of some combination of fruit, Greek yogurt, hummus and veggies/pita, or dinner leftovers. Lame, right? The only way that I can avoid this is by thoroughly planning ahead on the weekend. Usually this means making a big batch of something on Sunday that I can portion out and have ready to pack for lunch for the upcoming week. 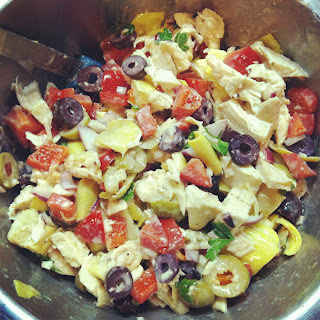 I did that this week and created a Mediterranean-Style Chicken Salad with some super convenient and healthy ingredients. I used a prepared rotisserie chciken breast from my grocery store (love these!) combined with some fresh veggies, artichoke hearts, and olives in a sweet and tangy red wine Greek yogurt dressing. I packed a serving in a small container along with some mixed greens, spinach, and tomatoes to eat with the salad-- a perfect protein and veggie packed lunch for the office! What are your secrets for packing a healthy lunchbox? In a large mixing bowl, combine chicken and next 5 ingredients through parsley. Stir gently to combine. In a small bowl or cruet, whisk together the vinegar and remaining ingredients through black pepper until fully combined and emulsified. Pour dressing over chicken mixture and toss to coat. Cover and refrigerate until ready to serve. Serve on a ciabatta roll, in a pita, wrap, with crackers or toasts, or over a bed of mixed greens. This would also make a great party appetizer served on toast rounds or slices too!